I thought I'd us this thread to show you what is going on over here. From tim to time I'll post up a few pics of projects we are working on. 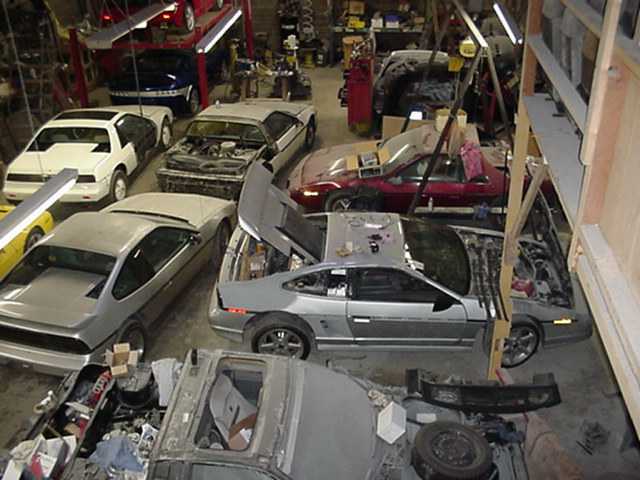 This time I'll show you how crouded it is in the shop when we put all the cars inside for the night. WOW! I can almost smell the grease from here. I think this could be my dream life. It doesn't get any better than that. When would be a good time to bring the GBCT up for some work?????? What cars are you taking to the WOW show ? you have a 240 with a v8? or is that dash on the self int he first pic from something else? If you're goin to hell, dont halfazz it, go all out, and shoot for Satan's right hand man. Archie, that looks like another choptop fastback there- the grey colored GT? The choptop count must be around 9 or so? '87GT 6" Drop, Can you say "Bagged"? Pictures and Details Coming Soon! 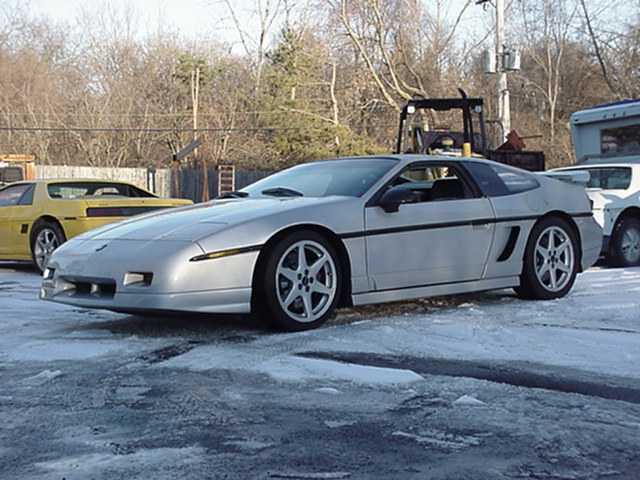 Are you going to build another Fiero this year like you did lastyear with the "Stinger"? Whooa Nelly! that's awesome! I can't believe the purple pavement eater hasn't been sold yet! What an awesome car...that goes for all of them! Cool!! 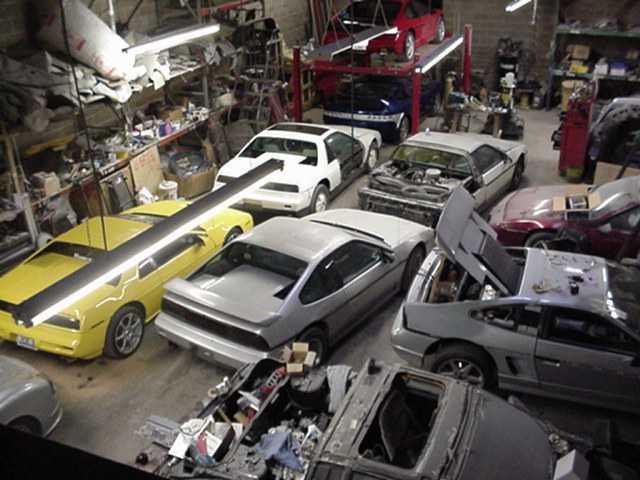 thats probably the only time I'll ever see that many fieros packed into one garage! I was thinking of another project, but I don't think you have any room left. I guess I have to wait till spring or summer, until you get caught up and make some room. I will let you know about the new project just as soon as I do a little more research, or you have some room. Can't sell the Yellow Stinger until I've built it's replacement. I could work on the GBCT next May, but You'd need to drop it off in January so I can test drive it for a few months. Seriously, give me a call and, depending on what you need, we can work it in during the next 2 months. Boy, nothing gets by you guys does it? You guys find everything in those pictures don't you? 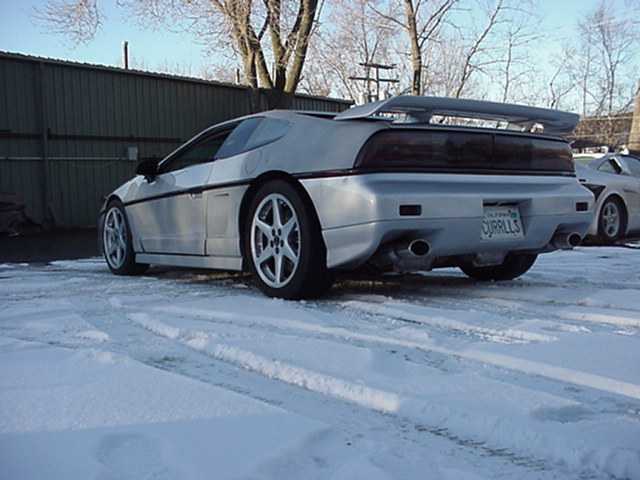 I built, drove & sold my V-8 powered Z car a long time ago before I ever did a V-8 Fiero. 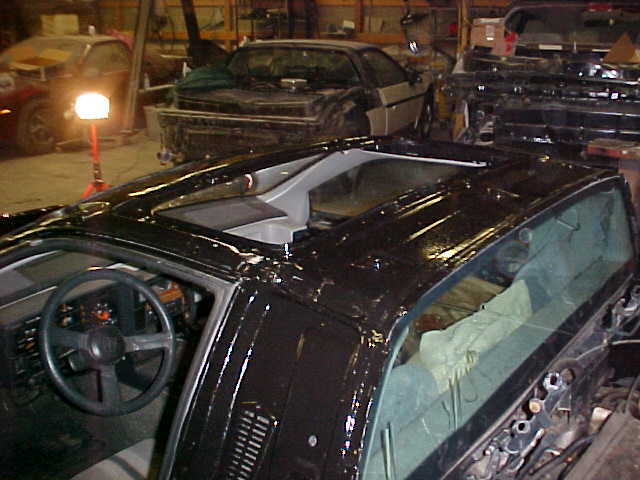 On the dash thing, lets just say that everything I have in that shop is Fiero related. Archie, that looks like another choptop fastback there- the grey colored GT? Yes it is, just finishing it up for a guy in CA. 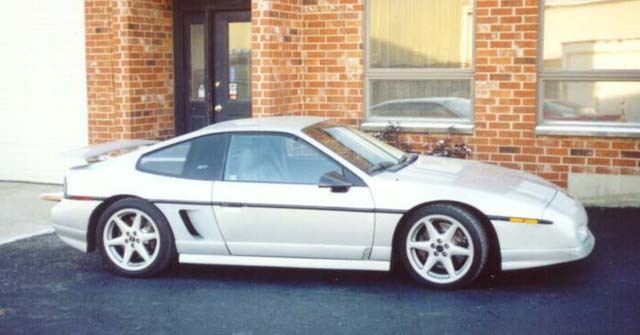 It's a real nice GT, he is going to do the paint etc. after he picks it up Jan. 6th. He monitors this Forum but hasn't joined yet. You guys ought to talk him into joining up. Come on Curley, join us! Not this year.... when you build a car like that you never want to get rid of it. And to build another one without selling the 1st one gets way too expen$ive. Besides the Stinger isn't quite done yet. I've got several new things to do to it in Feb. Thank You. I'm not really trying to sell the PPE right now. I want to hang onto it until Spring, so I can take it to the drag strip to see what it actually can do. Then I'll get serious about selling it. 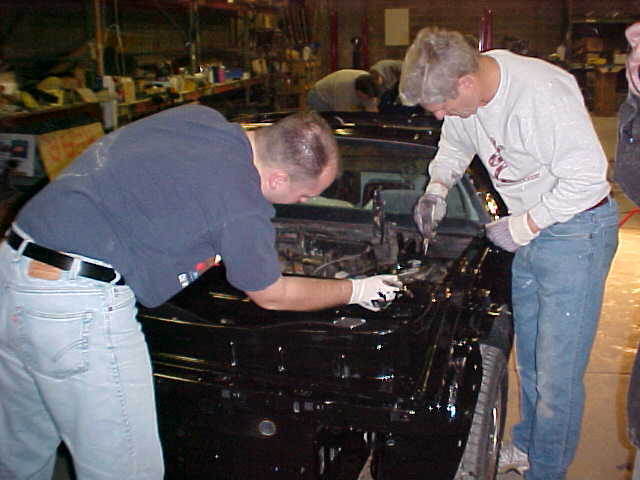 That's Mark (my paint guru) & Cary Decker (PFF member GMGW) Polishing my new paint job today. The only thing else that happened today that I can report on is that the NIFE WOW Show Fiero Chassis was worked on by the NIFE Board. Clockwose from the top.... Lady Pegasas, Pegasas, PaulV (Membership Director), Jim Hallman (President of NIFE), Rich Benanti (NIFE VP) & That's Carl "Haze" over there by the driver's door. Seriously... Look's like a good time! ... And to build another one without selling the 1st one gets way too expen$ive. Sounds like a Conundrum to me. Looks like you'll be holding on to the Stinger for a while. I need to get one of my cars up to your shop soon. You do awesome work. sweet, i was just gonna ask what color did you decide to paint the Fino. That color looks awsome, especially with the silver taillight surround. Now it needs a 4th gen firebird dash! Are there any mods required to the windshield wipers on a chop top or do you just use a lot of rain-x? Thanks! The wipers don't need to be modified. Rain-x doesn't work so well on a chop top because the windshield is at such a low angle that, when sitting still, rain that hits the windshield runs up and over the roof. Thanks for the response and a chuckle! 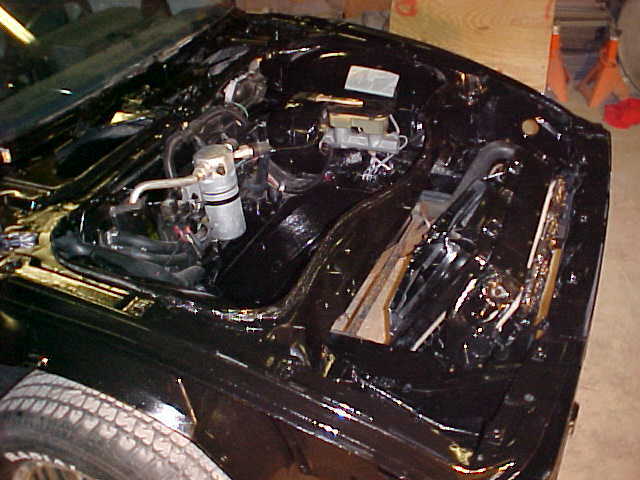 I'm very much interested in having you do a chop top/v8 conversion on my 88 - but - first have to liquefy another asset (70 SS454 LS7 Chevelle) to fund the Fiero madness! 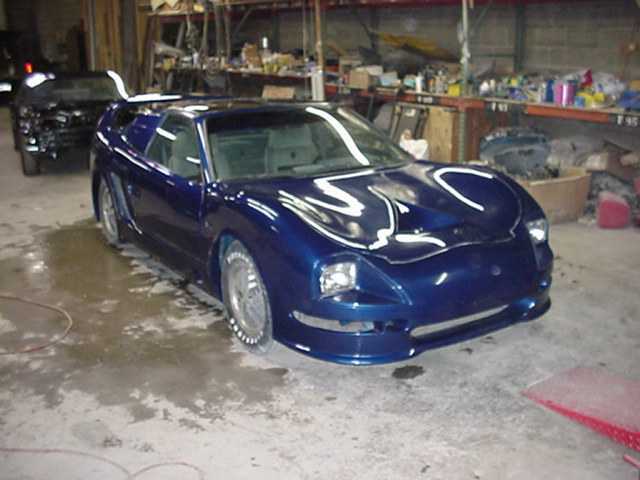 The WoW car is a display car that will be in the 41st annual World oF Wheels Show in Chicago. We will finally show that the car is not just fiberglass and plastic. 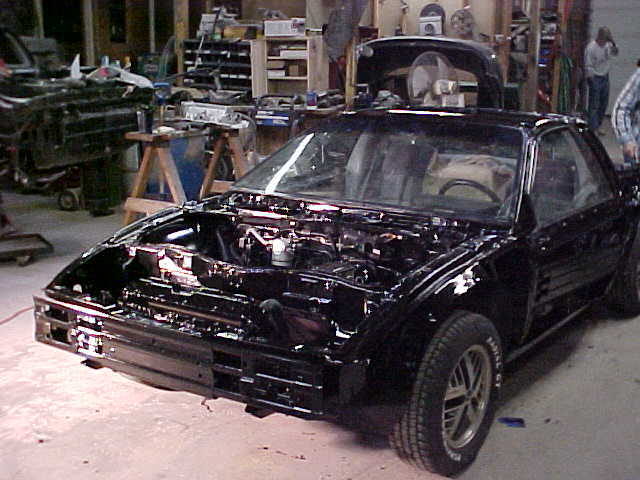 IT is a full running chasis and is being painted with PR15 to give it the gloss new car look. here are a few pictures. 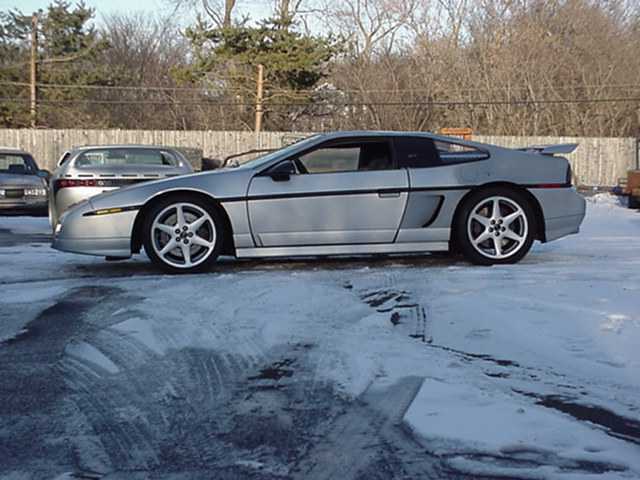 I wish they would cut a Fiero body right down the center. Then mount it on that car. I think that would be impressive, maybe next year. All in all its coming a long great. Hey Archie, any chance of holiday charity passing down a few V-8 conversions to us needy folks. "Wise man say, when in doubt, mumble." Hey Archie What Do you do With the door glasses on a chop top do they still roll up all the way. Looks to me as if you laid the roof back instead of a section. Intrested in hearing your comments. I chopped my s-10 in sections,Therefor the windown in the door frams won't roll all the way up. 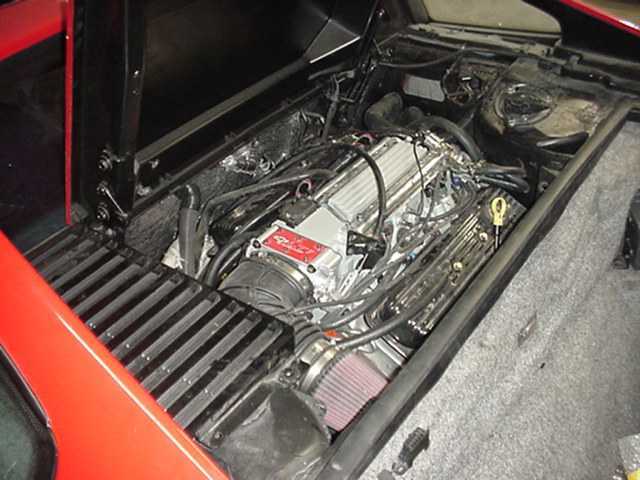 Another LT1 Fiero is ready to Rock. This one will be on it's way to FL tomorrow. 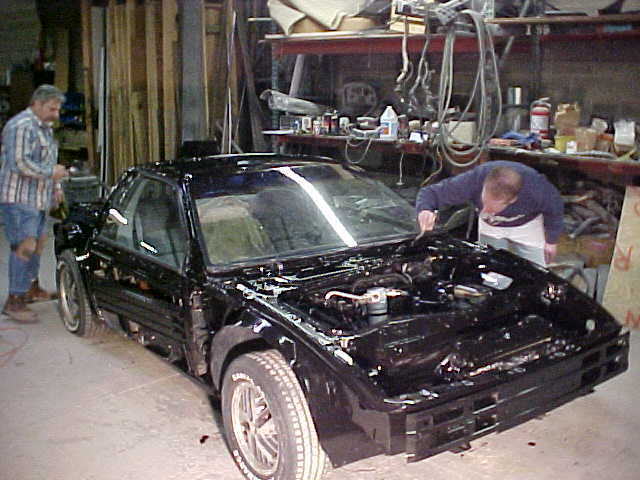 After the owner puts a few finishing touches on it, you'll see it at The Daytona Show. Can we get some more pictures of the silver Choptop? And another LT1 with the intake plenum reversed. So, how much extra do you charge to do that? He is leaving here tonight to drive it home. Nice, how about some VIDEO!!! Do you want the Video on this Chop top car or the latest LT1 car. This Chop Top looks good but it's only a NStar, so it make for a very good Video. 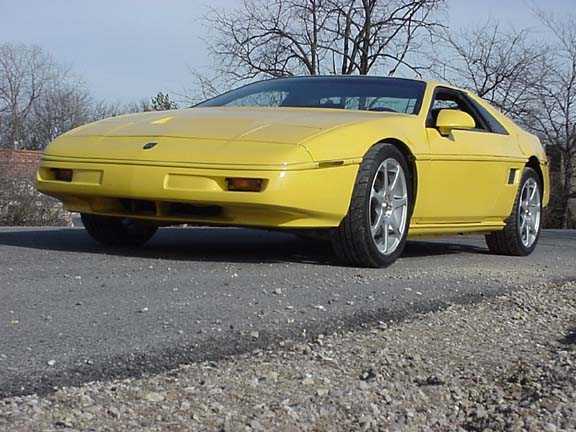 Do have some Video on the LT1 car though. DAMN THAT Silver Choptop is sooooo sweet! I would love to have that done to my car! Have you ever done a chop to a notchback with the aero package (aka early GT, Late SE)? That has SUPERCAR written ALLLLLLL OVER IT! Great Job Archie!! Anybody else notice the wing on the back of this GT? Look like maybe it's set back an inch. 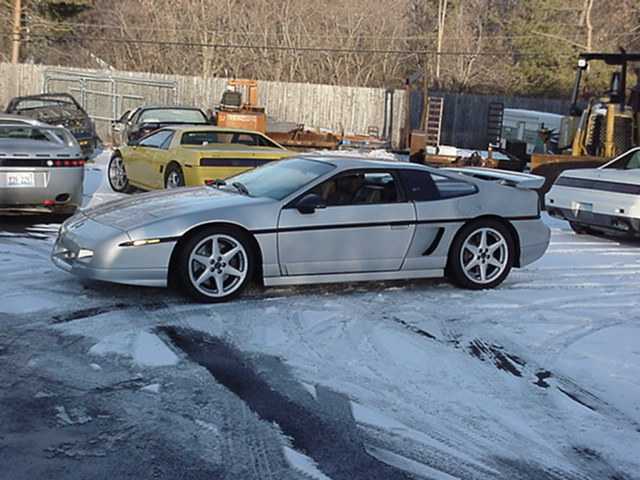 A very cool looking Fiero. Do you have any interior pics after the top is chopped???? If your going to make me pick CHOPTOP!! But I bet we all would like to see BOTH videos! The silver chop top is NICE! Great work (as always) Archie! Are those custom scoops on the Silver Choptop? Or are they Aus's Stage 2? I can't really tell with the lower trim attached like that, but they kind of have the shape/style of the Stage2 kit...? My good lord is that silver GT ever beautiful!!! 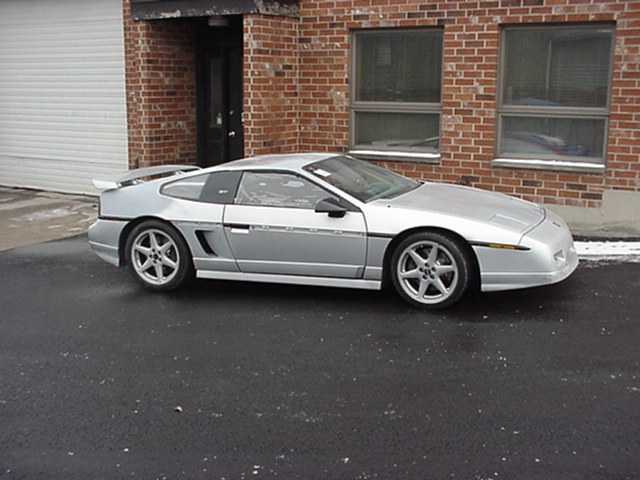 Please tell me the owner is going to repaint it silver as it looks kick a$$ as the current color. BTW, what year is the car? I can't really tell from the pics whether or not it has the two tone silver as on the the 86-87's or the single tone as on the 88's. Give my compliments to Curls! I was just looking at that thinking the same thing. I was about to email Aus, and see if you can keep your normal trim like that with his scoops, and if so, what the cost will be without them. I guess I will just wait and see what Archie has to say about it.